At the launch Translink and U105’s “Stuff A Bus” initiative are: Ian Campbell of Translink; Major Paul Kingscott of the Salvation Army; the SVP’s Archie Kinney; and Denise Watson of U105. 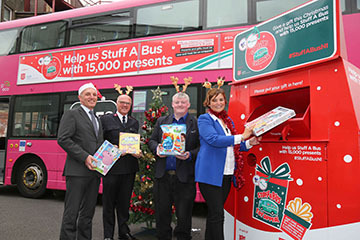 A bid to stuff a double-decker bus with 15,000 toys for needy children has been launched in Northern Ireland by public transport provider Translink and local radio station U105. The “Stuff A Bus” initiative is being held to support the annual Christmas Family Appeal organised jointly by the St Vincent de Paul and the Salvation Army. “Stuff A Bus” was run for the first time last year, with donors from all sectors of the community providing more than 12,000 presents for children who otherwise wouldn’t have much cheer on Christmas Day. In fact, such was the generosity of Ulster folk that there were enough toys donated to stuff two-single decker buses. Now the organisers are trying to do even better, with a target of 15,000 donated toys and gifts – enough to stuff a double-decker. Translink has increased the number of donation drop-off points to 15, with collection bins at the bus stations in Antrim, Armagh, Banbridge, Carrick, Coleraine, Derry, Downpatrick, Dungannon, Enniskillen, Lisburn, Newry, Omagh and at the Europa in Belfast, plus Bangor and Layton Place train stations. Donations can also be made in Tesco stores, at Gordons Chemists outlets and at the Visit Belfast Welcome Centre. Organisers hope there will be enough toys for a “three-bell load”, a reference to the signal a conductors used to give bus drivers when the vehicle was packed to capacity. When the driver heard three rings of the bell, he knew the bus was full. All gifts donated to the “Stuff A Bus” campaign must be new and unwrapped. Donations suitable for older boys and girls, such as gift vouchers, boardgames, selection boxes and toiletries, would be particularly welcome. This is the 39th year in which the Salvation Army and the SVP have joined forces to organise a Christmas Family Appeal. Last year some 50,000 gifts were distributed to families in need in the six counties. “As a church and charity, we are inspired by the Christmas message to reach out to people in need,” said Major Paul Kingscott of the Salvation Army. “The Family Appeal allows us to help thousands of children and young people in Northern Ireland. The SVP’s Northern Ireland regional vice president Archie Kinney added: “The effects of poverty don’t stop just because it’s Christmas – they endure throughout the year. This appeal means so much to the families and groups who receive our donations of gifts as they are seeing smiles on little ones’ faces on Christmas Day rather than tears and anguish, which is felt ten-fold by the parents who are unable to provide for their children. “This year it is easier than ever to donate to the Family Appeal with drop-off points dotted right across the province. Alternatively, gifts can be left at any Salvation Army or SVP location or shop. It is wonderful to have such supportive partners in Translink and U105, and we are grateful for their enthusiasm for the appeal. We hope that the double decker is jam-packed with presents,” Mr Kinney said.